Page revised in January 2019 with many photos taken in December 2018. This villa along the ancient Via Severiana, was the first architectural work (ca 1625) by Pietro da Cortona, who is also the author of the painting. Because of its proximity to the sea the site was subject to corsair raids and therefore the casino had the aspect of a small fortress. We know that its construction was supervised by Bernardino Radi, who was in charge of the fortifications of Civitavecchia. 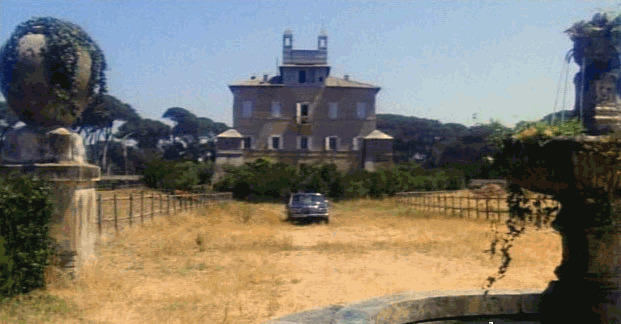 Pietro da Cortona built another (entirely lost) casino for the Sacchetti near the Vatican. The villa was bought by the Chigi in 1755 and it still belongs to them, although the very large estate which surrounded it was acquired by the State in the 1930s. The property is not open to the public; its gardens were modified in order to house a tourist resort, but the casino still retains its original design because of State laws protecting it. It was occasionally used as a set for movies (see a still - it opens in another window). The Sacchetti were not the first to build a villa at Castelfusano. Archaeologists have identified evidence of an ancient Roman villa which is named after Pliny the Younger, although it does not match the description he made of it. It is covered in a section dedicated to Ancient Ostia. 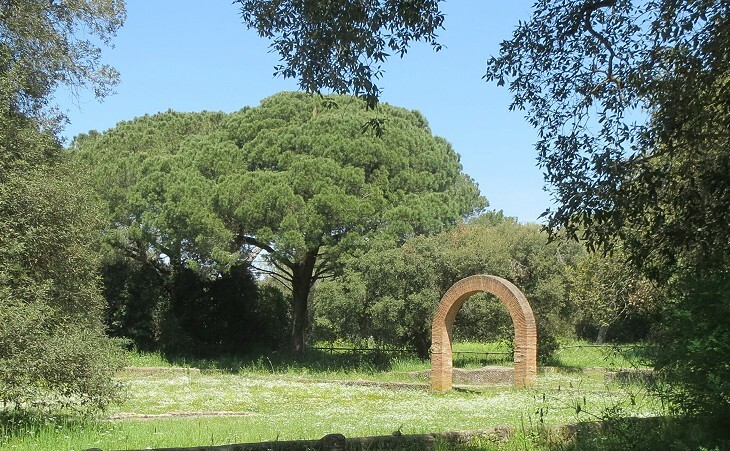 The pinetum did not exist in antiquity; the trees were planted by the Sacchetti because they absorbed stagnant water and thus prevented the spreading of malaria. 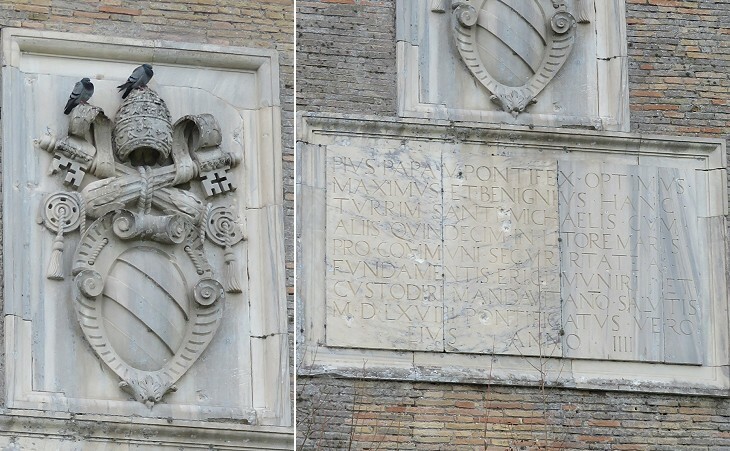 Pope Pius IV decided to build a tower at the mouth of the River Tiber (today a few hundred yards inland) to early detect the arrival of corsairs and to fire at their ships. Its design is attributed to Michelangelo, but the actual construction was executed by Nanni di Baccio Bigio, similar to what occurred for the external façade of Porta del Popolo. The tower was completed in 1568 when Pope Pius V had replaced Pius IV; the new Pope took the full credit for the initiative. New towers were needed because of the changes in the coastline which made some existing towers, e.g. Tor Boacciana, too far from the sea. Occasionally the coastline did not recede, but advanced and Torre Flavia, which was built at the same time as Tor San Michele, was destroyed by the waves. 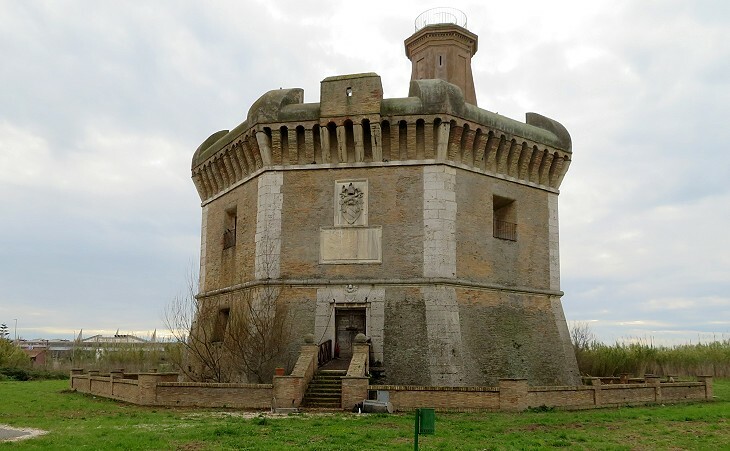 See some other coastal towers at S. Felice and a state-of-the-art early Renaissance fortress at Nettuno. While in the previous centuries the idea of a summer holiday was associated with time spent in the countryside, towards the end of the XIXth century sea bathing became a more exciting way to escape the heat: the beaches of Lido di Venezia (where Thomas Mann set Death in Venice) and Viareggio with their luxury hotels attracted the rich who found boring the traditional villeggiatura. Plans were developed for turning the beach between Tor San Michele and Villa Sacchetti Chigi into an inexpensive seaside resort where the Romans who could not afford to travel and to pay for lodgings, could spend their summer holidays at the sea ... sleeping at home, reaching the beach every day by a forty-minute rail journey and carrying a packed lunch with them. Fascism is known as the archetype of a nationalist and aggressive dictatorship, but Mussolini, who became Prime Minister in 1922, paid more attention to domestic issues than to foreign ones in the first years of government. Paolo Monelli, one of his biographers, called this period Mussolini piccolo borghese where piccolo borghese is a reference to the emerging narrow-minded middle class of post-WWI Italy. In Rome this class was mainly composed of civil servants, people with a degree of education and the desire to imitate the standard of living of the upper classes, but prevented from doing so by a rather meagre salary. 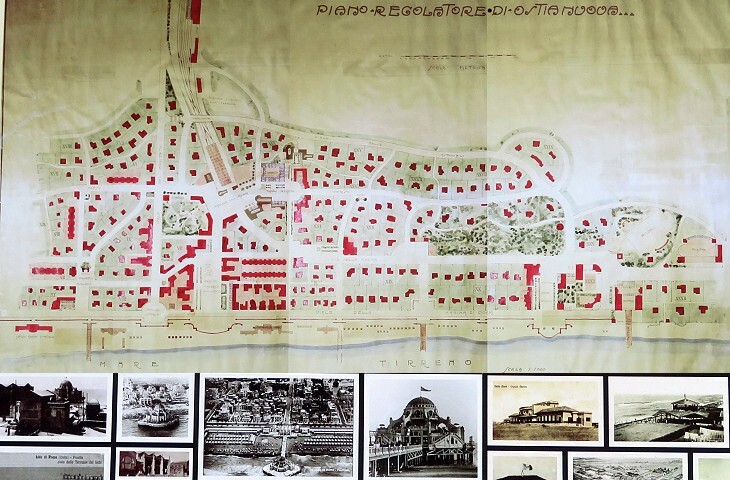 The plans for Lido di Ostia were resumed and a fast electric railway was completed in 1924. Its Roman station was situated near Porta S. Paolo: the circle line tramway made this location within easy reach from all parts of the city. 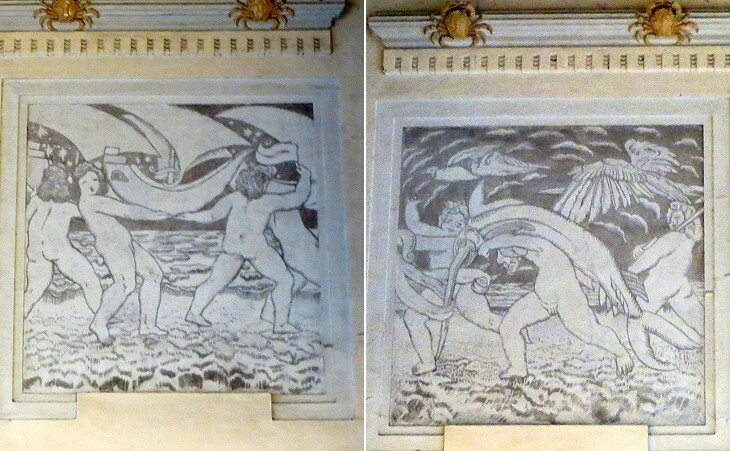 The decoration of the building gave travellers an anticipation of the joys of their day at the beach. 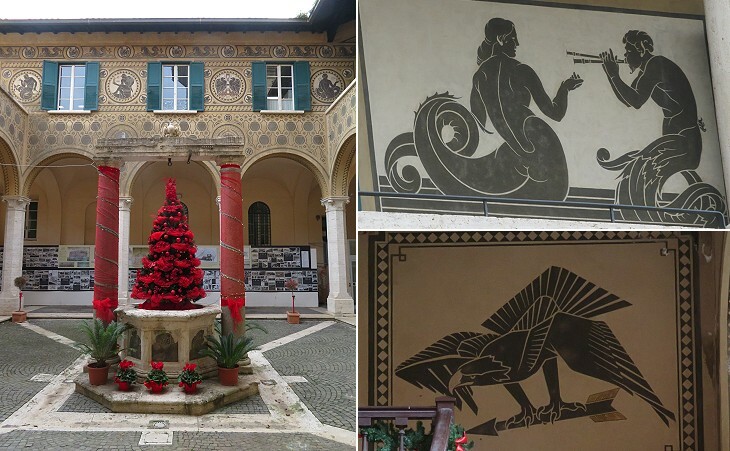 The main building of Lido di Ostia, a detached section of the offices of the City of Rome, was decorated with symbols of the nationalist rhetoric Fascism was in the process of developing (e.g. 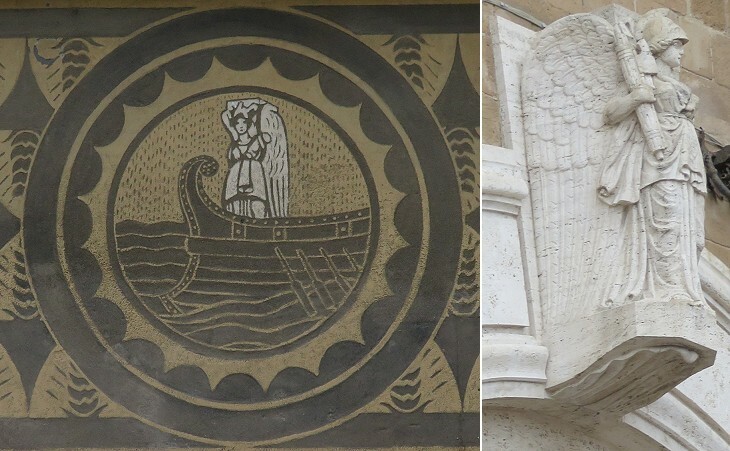 Roman eagles), but these were mixed with other references to less militaristic subjects (e.g. the mosaics of baths at Ancient Ostia). An explicit reference to Ancient Ostia was the repeated depiction of Minerva Victrix, a sculpture on a pillar of the lost main gate of the town. In the small sculpture above the entrance to the building the goddess was portrayed with the symbol of Fascism, rather than with the aegis, her shield. 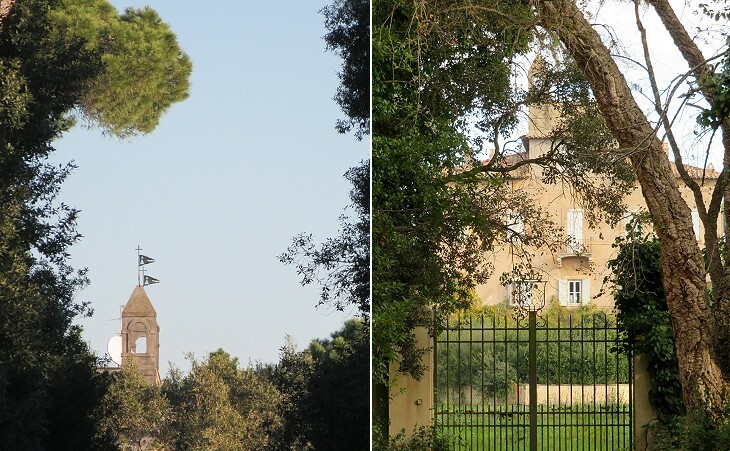 The initiative to build a church to Mary Queen of Peace as a vow for the end of WWI was taken by Cardinal Vincenzo Vannutelli in 1916, shortly after he had become the Dean of the Sacred College of Cardinals and therefore the Bishop of the suburbicarian see of Ostia. The actual construction of the church began in 1919 and it was completed in 1928. 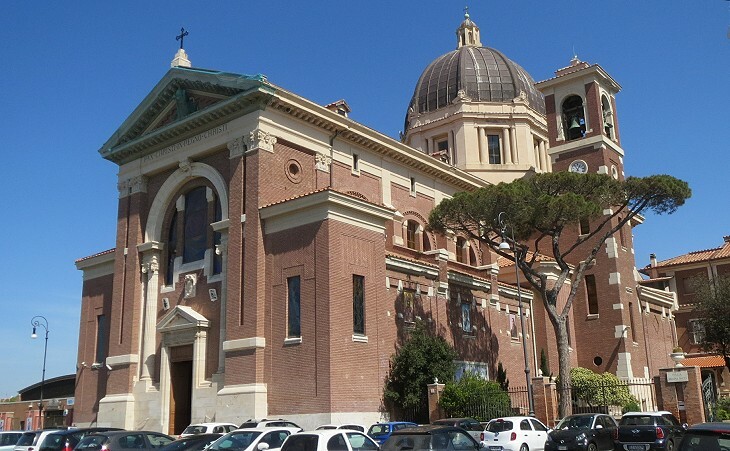 Cardinal Vannutelli wanted the church to be the Cathedral of his diocese (instead of S. Aurea), but in 1948 Lido di Ostia (but not Ancient Ostia) was incorporated into the diocese of Rome and today Santa Maria Regina Pacis is one of the five parish churches of the neighbourhood. Today Lido di Ostia is a large residential quarter still part of the municipality of Rome, but the Romans continue to go there on a daily basis using the electric railway: private beach facilities have special rate arrangements with companies and public offices. Some sections of the beach can be freely accessed, but they have limited facilities. In recent years a very long free beach was opened to the public south of Lido di Ostia. 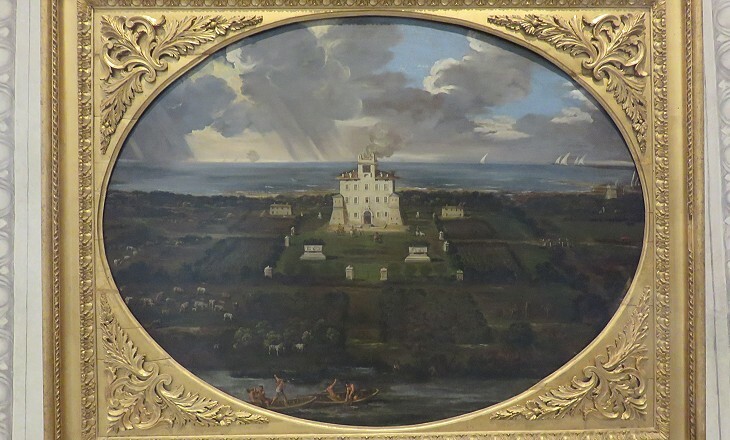 It belonged to a summer residence of the President of the Republic. People used to trespass through holes in the fence and the beach became known as il Buco (the Hole): it was not a beach for families to say the least. In the end a minor section was retained for the Presidential residence and it was better guarded, while the major part of the beach was opened to the public: it is divided into two sections: one known as I Cancelli (the gates) is a sort of expansion of the free beaches of Lido di Ostia; the other, known as Capocotta, caters for naturists. Voicing Your Views and feeling better!